Natural enzymatic digest of whey protein isolate, gelatin (capsule) and magnesium stearate. 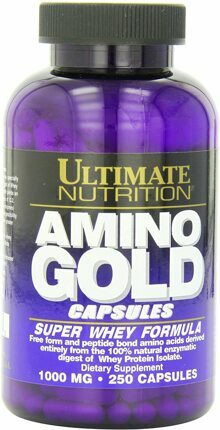 As a dietary supplement, take 9 capsules daily (3 capsules three times per day between meals). Ultimate Nutrition‘s Amino Gold is a full-spectrum amino acid nutritional aid that can help maintain optimal levels of amino acids in the bloodstream and promote good health at any stage of life.